Who first thought about solar-powered cars? Not just electric cars, mind you, but cars that run on solar power alone. Recent news stories have surfaced about Toyota's plans to build solar panels into the roofs of their successful Prius gas/electric hybrids. The additional power would take care of air conditioning. The new Mindset AG Six50 sedan also sports solar panels for providing power on-the-go. The company claims that 10,000 of them will go on sale in 2009. Still at the prototype stage (indeed, at the moment there’s little else), the car is designed to weigh about 800 kgs and be 4.2m long. It is yet one more auto in the long line of hybrid vehicles trying to be the most efficient method of private transportation. But we have to admit that the lines of the vehicle certainly caught our eye. 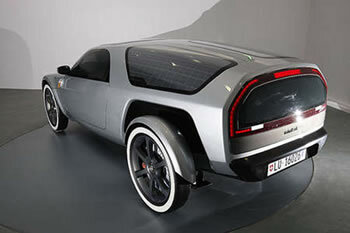 The front circular headlights are reminiscent of the 60’s but the rest of the vehicle screams future-forward. The roof comes equipped with solar panels that power the lithium-ion batteries, providing around a 100km drive per charge. The most striking, and possibly coolest, feature? Gullwing doors. But who first thought about a solely solar-powered vehicle? The vehicle that is widely claimed to be the first example is this DIY model by Alan Freeman of Rugby in England in 1979. In 1955, what was billed as the world's first solar-powered automobile, designed by William G. Cobb, was demonstrated at the General Motors Powerama in Chicago. However, I believe that this was a small fifteen inch model, called a "sunmobile." But at least the concept was there. It was powered by 12 built-in selenium photoelectric cells. The light was converted into electric current that powered a tiny electric motor with a driveshaft connected to the rear axle by a pulley. Any other references to actual prototypes or references to vehicles prior to 1955 (or 1940) would be appreciated. 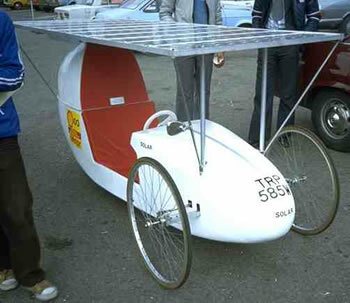 In recent history, there have been lots of great contests for solar-powered vehicles.